Torre Verde & SPA, full rental cottage for two people. It was more than 10 years ago when we discovered the small town of Martinamor, in the center of the province of Salamanca, at almost 1,000 meters above sea level, with beautiful views of the mountains of Béjar and Gredos. We found in this small village what we were looking for: Tranquility, rural charm and closeness to the big city, together with the traditional character of the Castilian countryside. A short time later, Torre Verde emerged. We wanted to offer the possibility of sharing our experiences with those couples with similar concerns. A rural house for 2 people with a private SPA area that reflects our love for the natural environment with all the comforts of the city and contributing what is in our hands to offer you entertainment with a taste of the countryside. Located in a privileged natural space for bird watching. 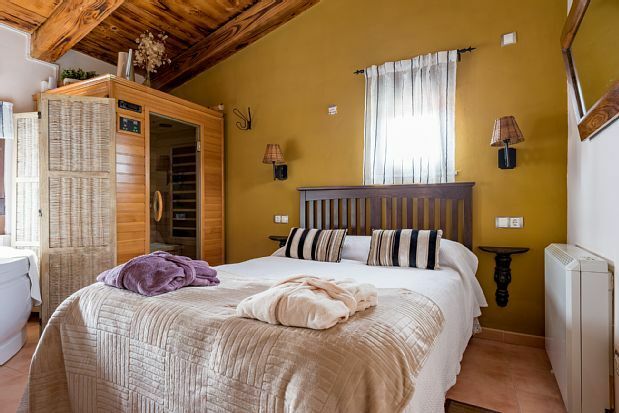 Casa Rural Torre Verde & SPA, registered in the Registry of Tourist Accommodation of Castilla y León with the number CRA-479-SA-5, with capacity for a couple. Free wifi for our customers. Rural house of 4 stars, with luxury qualities, exclusive for 2 people. Jacuzzi and sauna in the room. One step away from the Green Route of La Plata and the Tormes River, and 15 minutes from the city of Salamanca, in the heart of the Charro Field. La estancia fue increíble el estado de la casa perfecto y la atención recibida perfecta. Muchas gracias, Miguel Ángel. Nos alegramos muchísimo de tus palabras. Esperamos veros por Torre Verde otra vez.